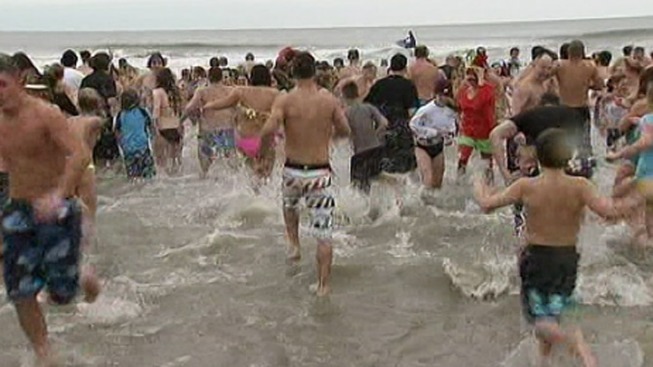 For the annual New Year's Day event, brave souls charged into icy waters all across the United States — from the Jersey Shore and New York City's Coney Island to the less wintry beaches of Southern California. But this year, the plunges held a special significance for hardy swimmers at New York and New Jersey beaches, many of them hard-hit by Superstorm Sandy last year, and many of the plunges raised money to help victims of the hurricane's devastation. "This is something I’ve done a couple years anyway just for the sake of doing it," Thomas Pirrone of Sicklerville, N.J., told NBC 10 Philadelphia on the beach in Ocean City, N.J. "Why not do it for a good cause?" Swimmers nationwide took to their nearest ocean, lake, river or even swimming pool Tuesday — some for charity, some still just for the sake of doing it. Pittsburgh swimmers took to the Monongahela River, Cleveland residents jumped in 38-degree Lake Erie, and San Franciscans ran into the frigid Pacific Ocean, as did Californians in the warmer climes of La Jolla, NBC 7 San Diego reported. In the Dallas suburb of Frisco, Texas, families supporting a scholarship fund made do with a swimming pool chilled with ice cubes, NBC 5 DFW reported. Polar Bear club members and others were raising money for Sandy relief efforts at Coney Island in New York, according to NBC 4 New York. In Ocean City, members of the Wish Upon a Hero Foundation, which has provided assistance to South Jersey victims of Sandy, ran into the surf, too. "They sent us clothes within a few days and made sure we got back on our feet," said Ken Murphy, a Superstorm Sandy victim. Other charities were well-represented, too. In Atlantic City, close to 200 people sprinted into the water to help the AC Polar Bear Club raise more than $2,000 for the Multiple Sclerosis Association of America. "It’s more than I expected, it’s absolutely terrific," said Dale Raesly of Levittown, N.J. "Everybody should come out here and support this cause!" In Coney Island, the Ice Breakers tried to raise awareness of water pollution, and the Polar Bear Club in Brigantine, N.J., where many people were impacted by Sandy, supported Fisher House, which provides transportation and housing to the families of wounded military members. "We might have lost our personal items and our personal things," said John Hand, a Brigantine plunge organizer. "But we still have our arms and legs. Right now what we’re doing is for our soldiers, our men and women overseas." The location for this year’s plunge in Brigantine had to be changed, since the beach where they normally held the event doesn’t exist anymore due to Sandy. "From this storm, there’s no seawall left," said Hand. "It’s got to be a better year," said Billy Bryan of Brigantine. "Let’s hope so. For everybody."